Not sure where the time went but the weekend passed all too quickly. We attended our village Fayre with a Medieval theme on Saturday where the whole community turns out to browse the many stalls selling all manner of things from bric-a-brac, cakes, plants, vintage clothing , recycled sail cloth bags, cakes, juice stalls and promote local clubs and societies. What I did find on my travels around Barnes Pond was a stall selling French collectables, in a canvas holdal similar to the Efgeeco rod bag I found the previous week was a collection of French cane rods, few of the canes matched up so I asked if I could just buy the rod bag, a bit of haggling took place and after a 25% discount was offered I became the bags new owner. From another stall I purchased a cobweb ridden Brady game bag, once dusted down it was in fine condition with all leather straps intact, pleased with my £10 spend before the masses descended I headed home in order to collect young Tales for a day of fun in the park in the bright warm July sun. Having agreed with young Tales that we would go fishing on Sunday the weather had changed overnight, for Sunday morning it was overcast with heavy cloud, a fine mist of drizzle filled the air and on reading the Tackle Box blog report both walls were closed at Brighton Marina the chosen venue for a days fishing by his Lordship. As new plans had to be drawn up we decided to head South to fish the Itchen on a stretch were we know it can be productive. After an hours drive we arrived at the River Itchen, dizzel still fell from the sky and dotted along the bank were several fishermen. We first opted to set up with a fly rod but soon realised that if we were to catch anything we would need to rely on a float or ledger set up with maggots, which was fine except we didn’t have any maggots. Improvisation is something we are use to so the other option was to seek out some worms from beneath fallen branches however a young lad was fishing close by and we asked if we could buy a handful of maggots as we tend not to over bait the water and fish sparingly with just a float and a couple of maggots suspended beneath or a small weight with a maggot on a 10-12inch trace. At this stage things were looking up as we’d witnessed several other anglers catch chub, perch and lampreys. Unfortunately for us we decided to fish the opposite bank and within 20 minutes of setting our swim was to be bombed by a young lad to ran from behind us and jumped fully clothed into the river. The next annoyance was a dog owner who decided to throw a stick into the rive infront of us followed closely afterwards by a black Labrador ….if that wasn’t enough 5 canoeists turned up and paddled straight over the submerged line, you could see the frustration on the face of young Tales however he was patient enough to continue for a while longer hoping that the fish would come back, sadly they didn’t. 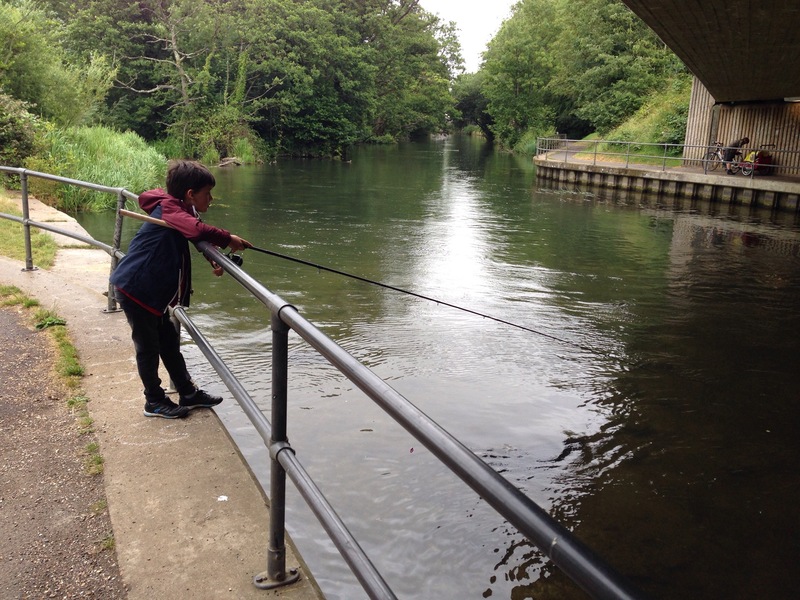 There is a fine balance on sharing the water with others, however it would be nice if members of the general public had a little more respect for anglers, surely common sense would prevail but seemingly not to be the case.